The Onion and A.V. Club hosted Just Another Manic Monday, a rock showcase featuring prominent artists throughout the day at The Mohawk. This event was open and free to the public, and was a solid start to South by Southwest’s music week. 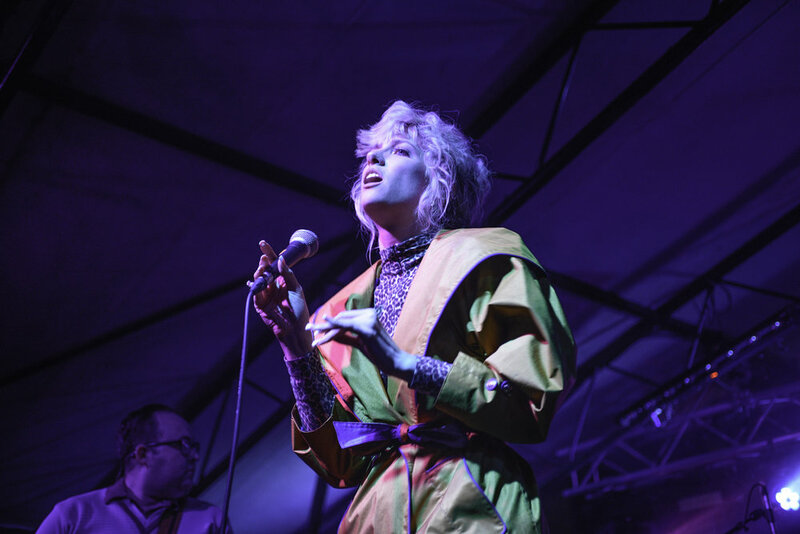 Some of the bands featured in the early evening were Portland’s Black Belt Eagle Scout, London’s Black Midi and Dublin’s Fontaines DC. Black Midi has created a lot of buzz in London, being heralded as “the best band in London” despite having none of their music online. 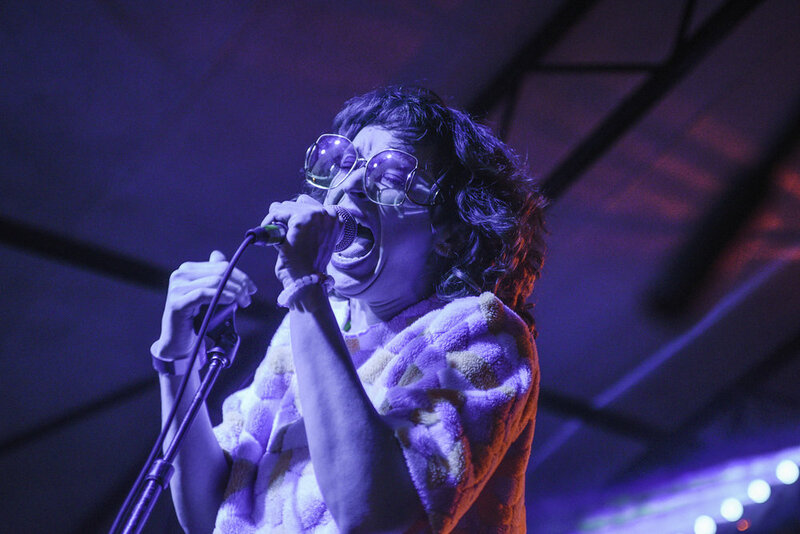 The young group, with giant black X’s marked across their hands, kicked off SXSW with bang. Their music featured lots of explosive guitar riffs and vocals, which balanced well with their thoughtfully written melodic lines. Fontaines DC kept a lot of this energy going, characterized by an amped up nervousness. The lead singer oftentimes paced back and forth on the stage, biting his nails before railing vocally into the mic. The audience loved it, with an all-girl mosh pit opening up at one point. Austin’s own Sweet Spirit made an appearance, performing a lot of new content, including “Los Lonely Girls” and “Touch.” Sabrina Ellis performed in a furry, rainbow colored two-piece outfit and has grown into even more of a star than the last time I had the pleasure of seeing them two years ago. This band is always a crowd favorite, and Ellis’s magnetic energy is contagious, which helps explain why Mayor Steve Adler created “Sweet Spirit Day” when their last album was released in 2017. Every member in this dynamic band works to create the fun, at times heavy, wall of sound Sweet Spirit makes. Coming all the way from Auckland, New Zealand were indie rock band The Beths. Playing music from their debut album “Future Me Hates Me,” the crowd sang along with lead singer Elizabeth Stokes as she sang about the anxieties of romance and trials of seeking intimacy. This performance was utterly seamless, with perfect synchronization between members as they moved throughout their set. Stokes’ delicate vocal melodies were called back by the men members of the band in a way that felt effortless and perfectly timed. Members burst into smiles at different points, expressing their enjoyment in performing that was echoed in the audience. The show did feel restrained at some points, with a shyness in Stokes that was balanced out by her short humor that came out when she spoke to the audience between songs. At first sight, the female-majority Washington D.C. group Priests came out in all the fashion and energy of a glam rock band. This punk rock band may have come to play, but to also deliver some electric rock jams. The group over the years has built a reputation deserving respect, landing themselves on numerous top album lists of the year for their last LP, “Nothing Is Natural.” Driving drum beats delivered by Daniele Daniele, accompanied by repetitive bass lines and ripping guitar melodies laid a base for lead singer Katie Alice Greer’s sharp, blaring vocals. They played new tracks from their upcoming album “The Seduction of Kansas” as well as older content, including their most popular song “Jj,” in which Greer sings borderline rants about her criticism of a boy who smoked different cigarettes from her and how that caused tension in the relationship. Priests was filled with complexities, smiling and asking earnestly how everyone was doing one moment and then taking everything up ten notches the next. The headliner of the showcase was Deerhunter, the Atlanta rock band fronted by Bradford Cox. The group released their eighth studio album, “Why Hasn’t Everything Already Disappeared?” earlier this year, so the set was for the most part from this album. When they dipped into older content it was from their earliest albums, including “Cryptograms” and “Halcyon Digest.” This band has an incredible way of coming together, playing shoe-gazy, ambient rock melodies that are all underlined by stunning, steady bass lines. Cox as a vocalist captures attention, ebbing and flowing as he sings mainly about the inevitability of death mixed with themes of national decay that characterize their newest release. The show was dreamy, with a tinge of edge, and was the perfect way to end a rock-fueled day.